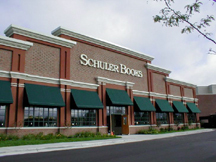 After 12 years -- and two expansions -- the Okemos, Michigan, location of Schuler Books and Music has a new home. At 24,000 square feet, the new space (in the Greater Lansing area) is a good deal closer in size to the 20-year-old Grand Rapids Schuler Books and Music, which is 35,000 square feet. Author Luis J. Rodriguez Opens Community Bookstore in L.A.
"Books saved my life," said author Luis J. Rodriguez in a recent interview. The 47-year-old author is a former Los Angeles gang member whose love and talent for poetry and prose convinced a judge to give Rodriguez a crucial break 26 years ago when he placed him, not back in prison, but on the road to a writer's life. Eventually a newspaper job took Rodriguez to Chicago. There, he started his own poetry publishing house and wrote the award-winning 1994 memoir, Always Running: La Vida Loca: Gang Days in L.A. (Touchstone Books). Baltimore has a new independent bookstore serving some of the northern suburbs of Baltimore County--Cross Keys, Roland Park, and Ruxton. The Ivy Bookshop, owned by Baltimore area native, Darielle Linehan, has been open since November 28, when eager customers were waiting for her to unlock the doors. R.J. Julia Booksellers, an independent bookstore in Madison, Connecticut, is branching out--or at least trying out a new offshoot. 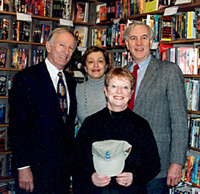 Owner Roxanne Coady told BTW that the store opened a "big, beautiful, mahogany book kiosk" in New Haven, Connecticut, on December 3. A Bookselling Institution Turns 25--And Becomes a Parent! There was cause for celebration in Arkansas this September as That Bookstore in Blytheville at once reached a milestone and gained a colleague: That Bookstore has become those bookstores. The day owner Mary Gay Shipley held a party to mark That Bookstore in Blytheville's 25th anniversary, her protégé MaryAlice Hurst, new owner of That Bookstore at Mountebanq Place, opened for business in Conway, Arkansas. Beagle Books owner Jill Johnson spent most of her adult career in the medical field, so when she found the 1937 former medical clinic, she felt sure it was the right place to open a bookstore.